Coyote Music mounted its largest promotional campaign to date for Viva Big Bend's inaugural music festival and industry conference. The effort required rebuilding portions of our website, as well as creating an entirely new Festivals section that could adequately handle a multi-city, multi-day event like Viva Big Bend. Now that the festival is over, we thought it'd be interesting to let you know what attracted the most traffic during Viva Big Bend 2012. 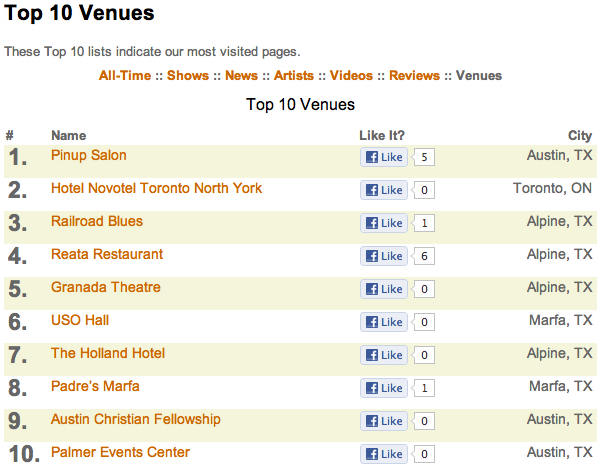 First, an Honorable Mention of sorts... Viva Big Bend's venues dominated our most-visited-venues list. 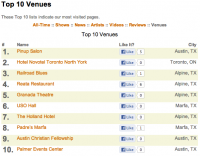 By the end of the festival, six of our Top 10 Venues were those hosting Viva Big Bend shows. Way to represent, West Texas music venues! 10. Bonnie Bishop and Owen Temple at Reata Restaurant Bonnie Bishop and Owen Temple were among the Day 1 artists who would set the tone for Viva Big Bend. Their show was great, and so went the rest of the fest. 9. Josh Abbott Band "Touch" The State of Texas, country music, and a military tribute—the Josh Abbott Band packs a powerful punch in this well-produced video. 8. Mike and the Moonpies @ Kokernot Field (Alpine, TX) A ninth inning rally by the home team, then the band with the funny name knocks one outta the park. 7. Check Out Coyote Music’s Ad in Texas Music Magazine’s Summer 2012 Issue! We loved everything about this festival, including working with Stewart Ramser and the folks at Texas Music. We hope you saw our ad in the magazine but if you didn't go ahead and take a look-see. 6. El Tule "Working Man's Cumbia" A really fun video and a song that'll get you dancing, by a great band out of Cedar Park, Texas. 5. Matt the Electrician, Scrappy Jud Newcomb, The Hickoids, and Texas Tycoons at Padre’s Marfa A bit of an odd twist of a line-up: you had the beauty of Scrappy Jud and Matt, followed by the Hickoids' raunchy punkabilly, and then the cover-tune safety valve of the Texas Tycoons to close-out the festival. 4. Amanda Shires "Sloe Gin" A beautiful voice, a sultry melody, and a close-up & personal video of a young musical sensation. 3. Texas Tornados Live at the Granada Theatre (Alpine, TX) Legendary music from these legends of country, rock, and tejano, played at a small venue in a small Texas town—a recipe for success. 2. Texas Music Magazine Invites One and All to “Viva Big Bend” July 26-29 What's more attractive than a warm welcome to a great event? This was Stewart Ramser's personal invitation to Viva Big Bend, and it caught many people's attention. 1. Viva Big Bend (festival mini-site) It stands to reason that the hub pages for the festival (Home, Venues, Artists, Schedule) would get the most attention, and they did. Keep an eye out for a few more reviews of shows from this year's Viva Big Bend, as well as videos from some of the artists. And be sure to visit Viva Big Bend's website, Facebook, and Twitter—the plans are already underway for 2013!